A juicy tender steak with the zing of Cajun spices, topped with sauteed mushrooms and onions. Make a marinade by mixing the steak sauce, bourbon, the 2 teaspoons of Cajun seasoning, the honey and mustard. A1 is the usual favorite for steak sauce, and you can use whiskey or brandy in place of the bourbon if you prefer. Put the steaks in a resealable bag with the marinade and give them a quick massage, making sure the marinade is evenly distributed. Let the steaks sit for at least 4 hours in the fridge (marinating overnight will enhance the flavors and tenderize the meat). When you are ready to cook the steaks, preheat the broiler or light a charcoal grill. Line the broiler pan with foil or put a drip pan under the grate to catch the juices. Remove the steaks from the marinade and drain them well. Season both sides of the meat with Cajun seasoning and discard the marinade. Broil or grill at medium-high heat until the steaks are lightly charred on one side, then turn over and finish cooking. Remove the steak to a warmed platter and let them sit for 2 to 3 minutes. Be sure to save an juices that collect on the platter to pour over the steaks. 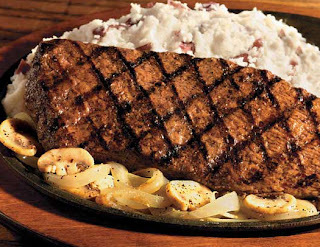 Serve your steaks topped with the sauteed mushrooms and onion, plus any reserved juices from the steak platter.